The new Kia Sorento stands out from the crowd of compact SUV’s. During the Los Angles Auto Show, I was lucky enough to have the opportunity to drive the new Sorento for a week in LA traffic and get a true feel for what it would be like to own a Sorrento. I was pleasantly surprised in so many ways. KIA has really stepped up their game and made big gains in sales and loyalty with many consumers. My first impression was that the ride was smooth and the turning radius made the Sorrento easy to squeeze into those tight parking spots thanks to the hydraulic power-assisted rack-and-pinion steering. The Sorrento is powered by a 2.4-liter dual CVVT 4-cylinder engine or a 3.5-liter dual CVVT V6 engine; both have hearty engines that get going quite quickly, backed by an six-speed manual or automatic transmission. There are so many impressive details on the new Sorrento. I’d recommend this reasonably priced SUV starting from $19,995. These great SUV’s also support jobs in the US. Kia Sorrentos are built in Westpoint, GA. The all-new Sorrento has exceeded expectations since going on sale in early January and is becoming KIA’s best-selling vehicle. The new SX trim adds an edgier attitude and comes standard with a host of luxury, convenience and technology features throughout. Offering a more muscular stance, Sorento SX has a unique front and rear look, LED tail lamps and redesigned 18-inch alloy wheels with a hyper silver paint finish increase its luxurious exterior appeal with leather-trimmed and heated front seats, electrochromatic mirror with Homelink® and a voice-activated navigation system with back-up camera, standard Infinity®7 audio surround sound system with 10 speakers, panoramic sunroof, seating for seven and a 3.5-liter V6 engine with best-in-class horsepower. 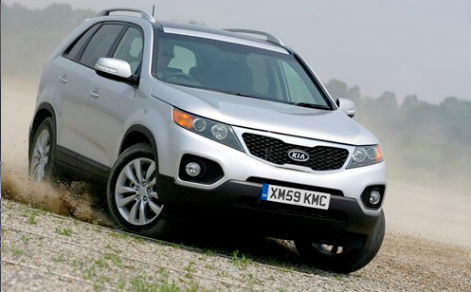 The 2011 Sorentos are covered by Kia’s warranty program, which offers unprecedented consumer protection. Including a 10-year/100,000-mile limited powertrain warranty, a five-year/60,000-mile limited basic warranty and a five-year/100,000-mile anti-perforation warranty. A five-year/60,000-mile roadside assistance plan also is part of the vehicle coverage.